Recently, historians claim they just may have found the actual cup that Christ used at the last supper. This item has become the theme of some romantic tales of knights in shining armor setting out to find this legendary vessel. 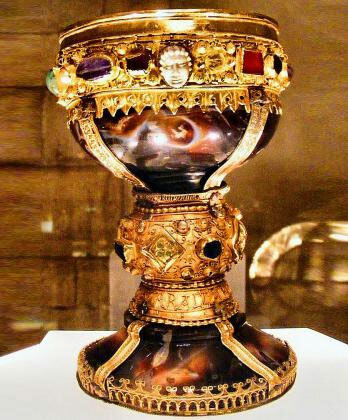 As a metaphor, any quest to discover the finest object has become a search for the “holy grail” of its kind. Of course, interest in seeing the authentic grail would be almost universal and to touch it would be reserved for a select few. Artifacts credited to Jesus are always shrouded in controversy but Jesus’ cup has always been available to those who choose to drink from it. Indeed, to follow Him they must. At the last supper, Jesus turned common bread into His body and table wine into His blood. This must have baffled all those present as it seems physically impossible even though they had witnessed many impossible miracles Jesus had performed. He forewarned them in a bold statement in a synagogue how they must drink His blood and eat His flesh to have life within them and many turned away when they heard this “hard” teaching. Not just a symbol, the grail or cup of blood which Jesus offers us is as real as love, truth and faith. The transformation that takes place when the cup is received and consumed is not ethereal or serene but substantial and compelling. It came with a caution notice when requested by the disciples James and John. They were asked “can you drink of the cup that I drink of and be baptized with the baptism that I am baptized with?” The answer came from the heart, looking Jesus straight in the eye. “We can”. AMEN! Your last two sentences sum it all up for us! Thanks again James. Previous Previous post: Is there a Difference? Does it Matter?